In coming up with some tasting notes and thoughts on this single malt that was bottled at full strength I found myself struggling. My struggle was two parts, first I paid extra for an unknown whisky to be shipped to me from the UK so I expected it to be interesting. Secondly, I found this whisky to be very challenging to categorize. I like to be able to taste a whisky and say, this is what I would do with this whisky (drink with meat, seafood, and I’d smoke it with this or that cigar or type of cigar). After tasting this single malt that was aged solely in a bourbon cask from Kentucky I’m not sure that what I tasted lived up to what I thought it would taste like. 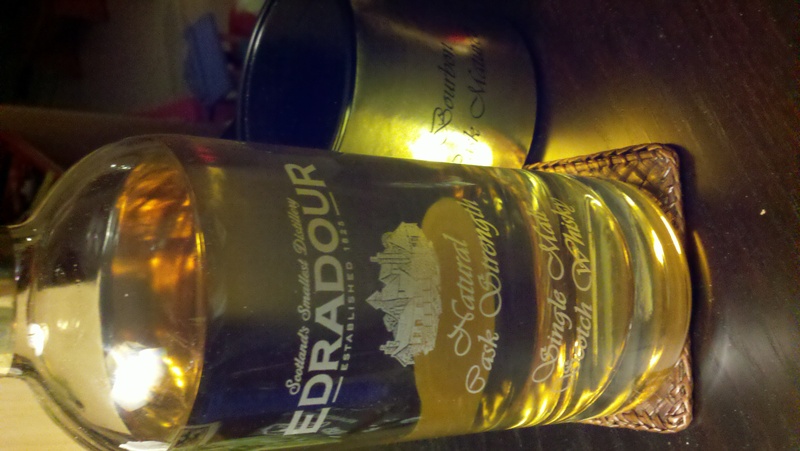 Having tasted a Bushmills Malt 10 that was aged in some Kentucky bourbon casks I probably had more of that feel in mind and what I actually got from the Edradour was not even close. Nosing the whisky is a bit familiar, soft vanilla notes etc… I did not pick up any Highland notes and thought that most of the nose was coming from Kentucky. I previously said I ordered this product hoping it would be interesting, well, when I tasted it I got what I paid for, only the interesting led to some confusion. This was not a product my palate found familiar. I was actually at a loss, the best I can say is that it has a lot of heat (alcohol burn) and a bourbon mixed with scotch sort of finish. Not what you’d call stellar notes! Like other whiskies or cigars that have left me confused I thought I’d wait, try it again and see what happens. Well, tonight I poured myself another generous dram and nosed, sipped, same reaction, then it occurred to me, the ABV(alcohol by volume) is fairly high, I might put some water in it. So I did, and then thought, maybe just a little more (I don’t think I’ve ever done this). Bingo. All of a sudden with the alcohol content knocked down I could really start to see the flavors. It all made sense to me and I found myself pleasantly pleased that I had found a fix for this whisky. By the way, the whisky is a bit viscous or oily. I think this would be a great whisky with pork. I did rather enjoy this alongside a CAO La Traviata maduro and think that it would mate well with full-bodied cigars at the full strength. To me, and I’m not sure I will ever say this again, but I’d knock down the alcohol content with some fresh water and enjoy it with a variety of foods and even some medium bodied cigars. That is, if you are in the UK. I don’t think you will find this one washing up on American soil any day soon.